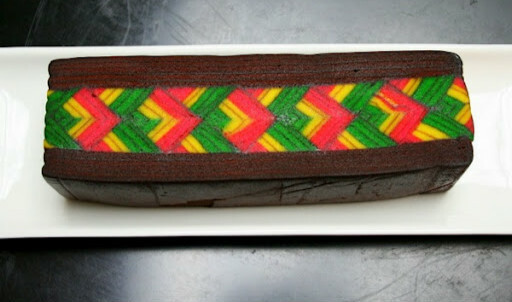 Cakes on this page are all Special Designed Layered Cakes. 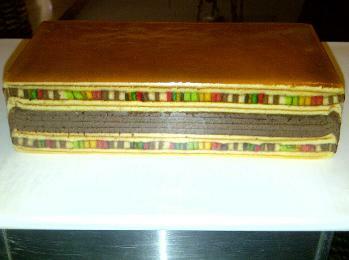 As for their cousin, the Normal Layered Cakes does not have grafic pattern. For your information it takes 8 hours to make One whole cake and are time consuming. 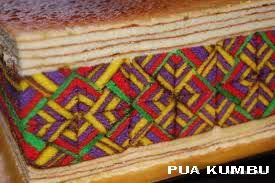 Sarawak Layered Cakes can be kept up to 2-3 month if keep in the chiller of your refrigerator without using any preservatives. 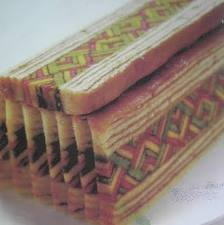 Sarawak Layered Cakes MUST ALWAYS be wrap with Plastic Cling Film and then with Aluminium Foil to avoid from being hard and dryness and place in a cover container. To last longer up to 6 month keep it frozen in the freezer. Thaw the cakes for 10 minutes at room temperature if it is in the chiller or if frozen, place it in the chiller overnight or thaw it to room temperature for 20 minutes before cutting the cakes. You do not need to preheat the cakes in the oven or microwave. 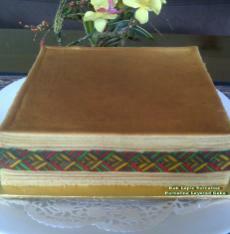 We take special order for special occasion. For more details please call, message or email us.